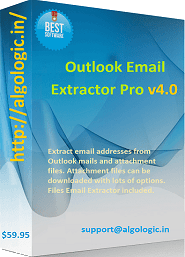 Outlook Email Extractor Pro v4.0 is a best software to extract email addresses from Outlook and attachment files (.pdf, .doc, .xls, .ppt, .csv, .txt) in Outlook emails. 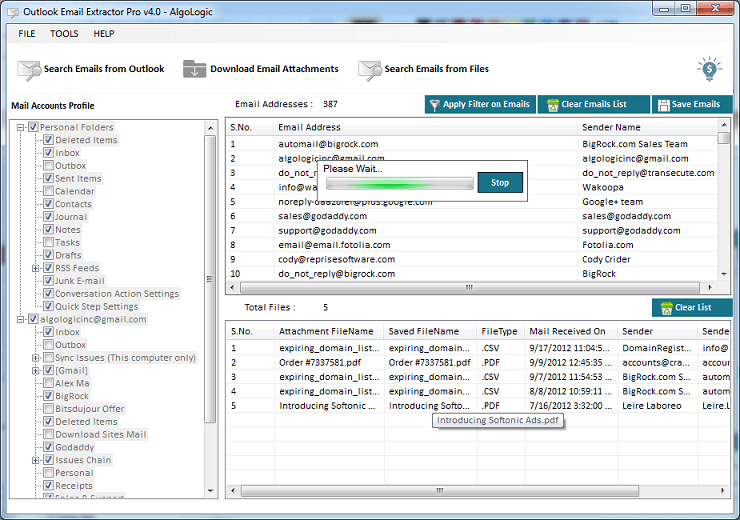 Outlook Email Extractor Pro v4.0 collects email addresses list from subject, mail body, cc, bcc, sender, recipients and attachment files of emails in Outlook. It extract email addresses and attachments from all emails in mail folders (Inbox, Sent Items, Outbox, Drafts, Deleted Items and other user folders) of Microsoft Outlook. Step 1: First you close Microsoft Outlook (if any opened). 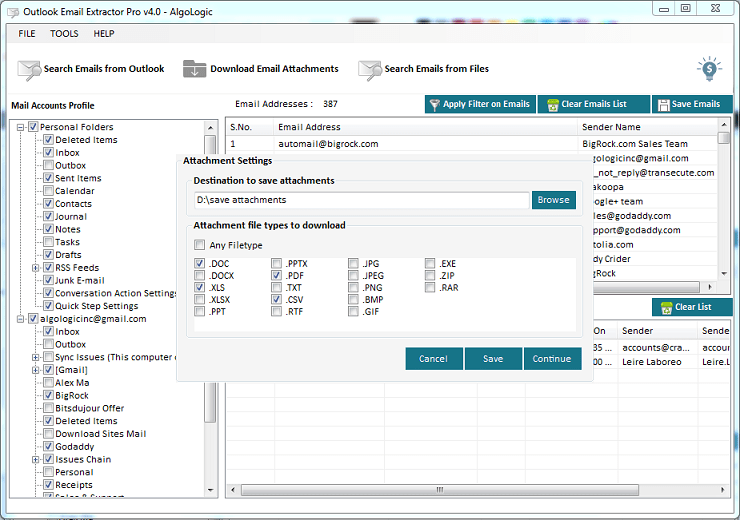 Start Outlook Email Extractor Pro v4.0 and select an Outlook profile from "Profile" dialog that would open just on start Outlook Email Extractor Pro v4.0 (Image-1). If you are unable to see "Profile" dialog, Please check in Taskbar (Image-2). License Registration window would not open if you registered the software license. You can close the window. 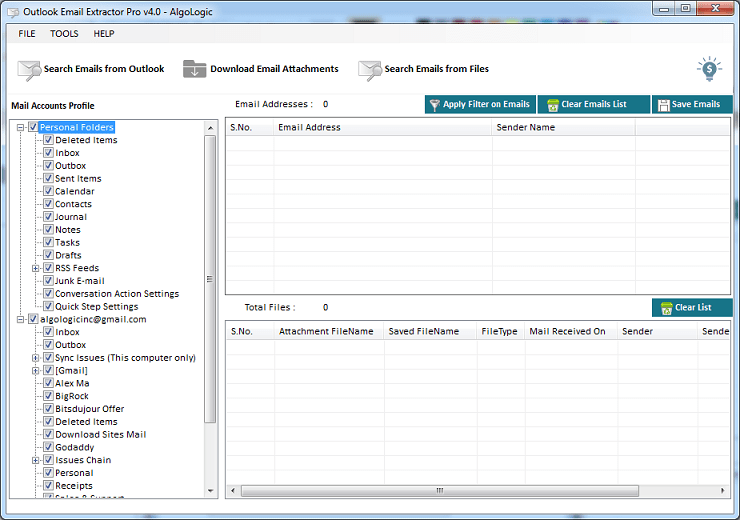 Step 2: On selection of an Outlook profile, All mail folders of Outlook filled in left pane in tree structure (Image-3). 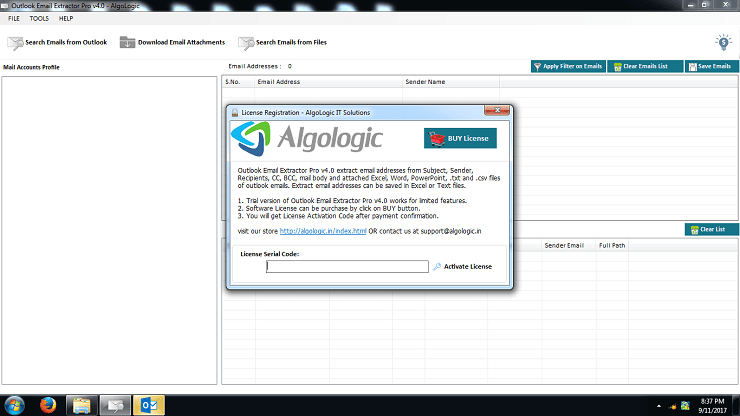 You can checked-unchecked any mail folder(s) from which you want to extract email addresses or download attachments. 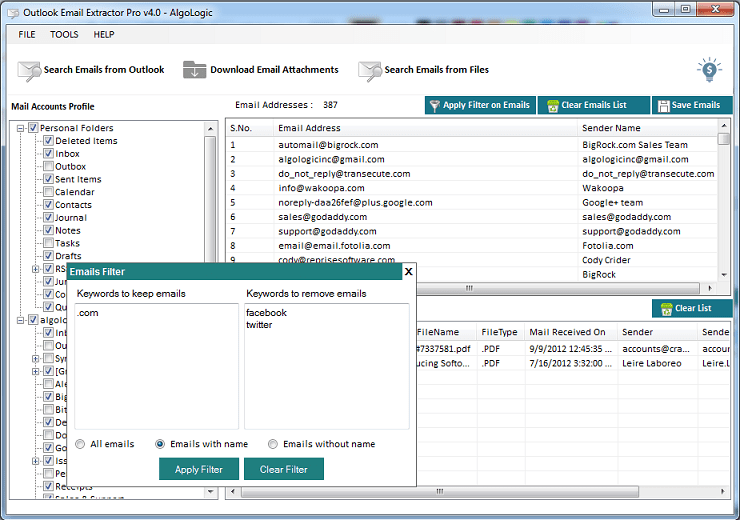 Step 3: Extract Email Addresses from Outlook Emails and Attachment files. 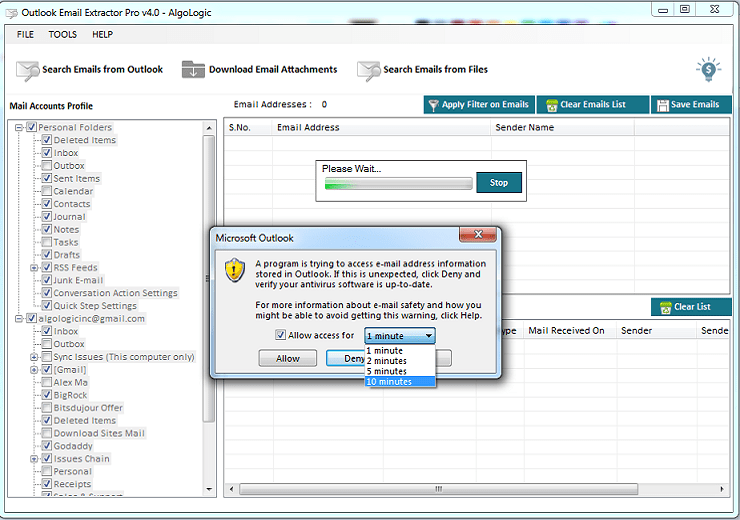 Click on "Search Emails from Outlook" button => Attachment files setting dialog would open. 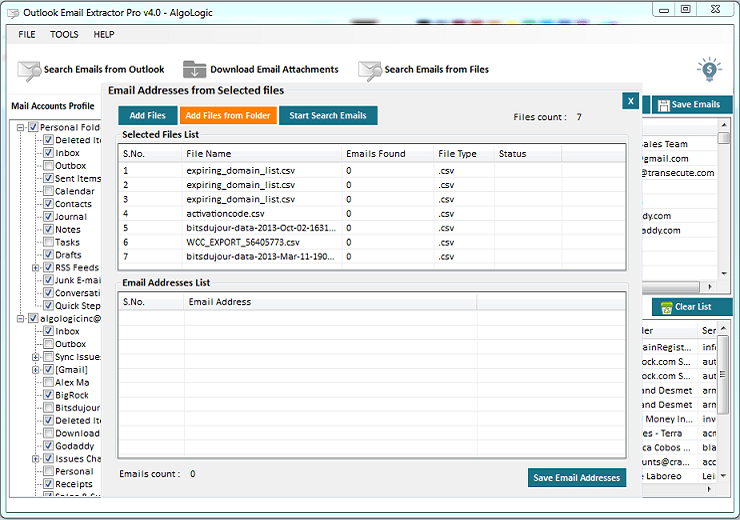 Here you can set file types and location to save attachment files to extract email addresses from attachment files (Image-4). Now click on "Continue" button to start extract email addresses process (Image-5). If Microsoft Outlook ask for access, Please Allow Access for maximum time (Image-6). 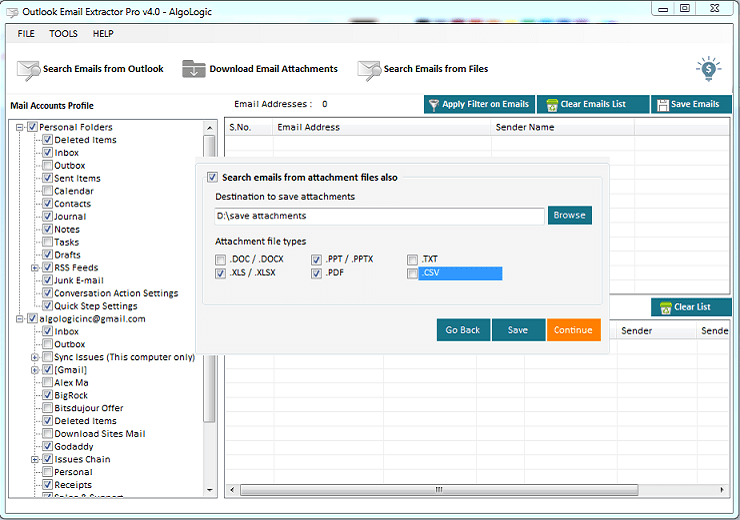 Step 4: Save Outlook Attachment files. Click on "Download Email Attachments" button => Attachment files setting dialog would open. 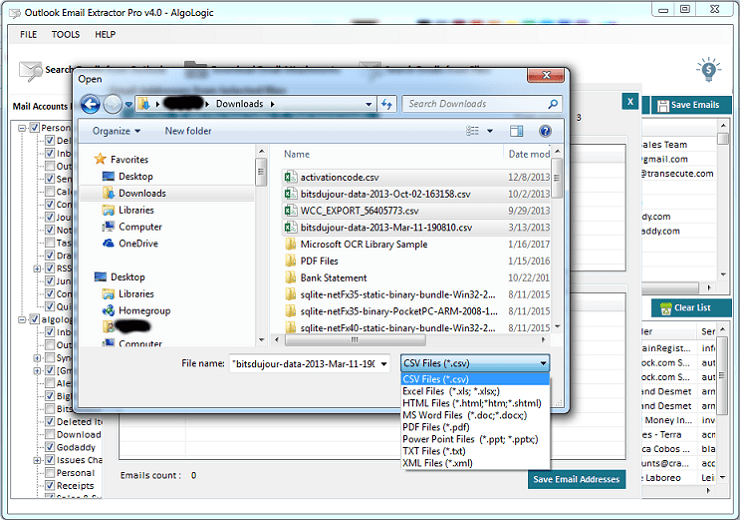 Here you can set file types and location to save attachment files (Image-7). Once you finalize the file types and location, click on "Continue" button to start download attachment files of selected file types from Outlook emails (Image-8). If Microsoft Outlook ask for access, Please Allow Access for maximum time (Image-6). 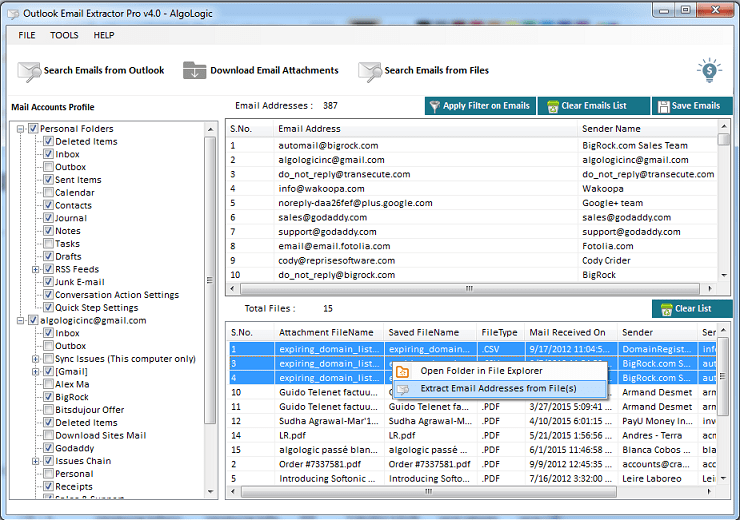 In trial version, The software can download only two files from Outlook emails but shows all attachment files information. 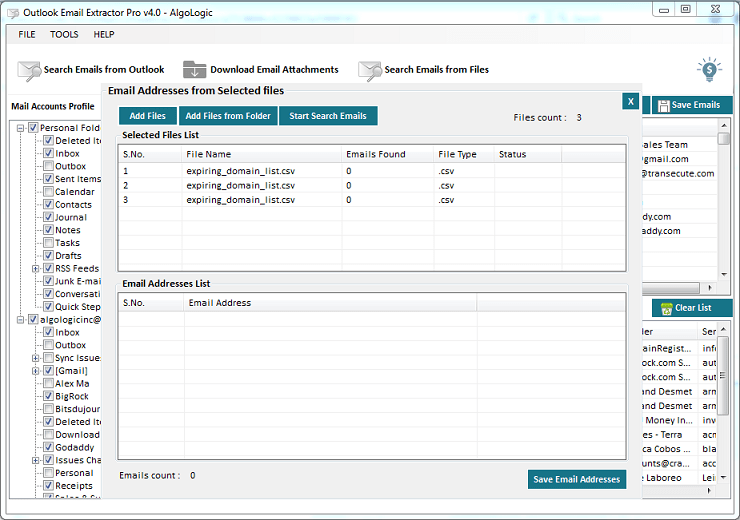 Step 5: Extract Email Addresses from Selected Files. Select file(s) from downloaded files list from Outlook email attachments => Right Mouse Click (Image-8) => click on "Extract Email Addresses from File(s)" menu. Or click on "Search Emails from Files" button. => A window would open having option to Add Files / Add Files from Folder (Image-9). Once required files added to the list, click on "Start Search Emails" button. It would extract all email addresses from files (Image-12). Extracted email addresses can be saved with sender's name in Excel / CSV / TXT files. 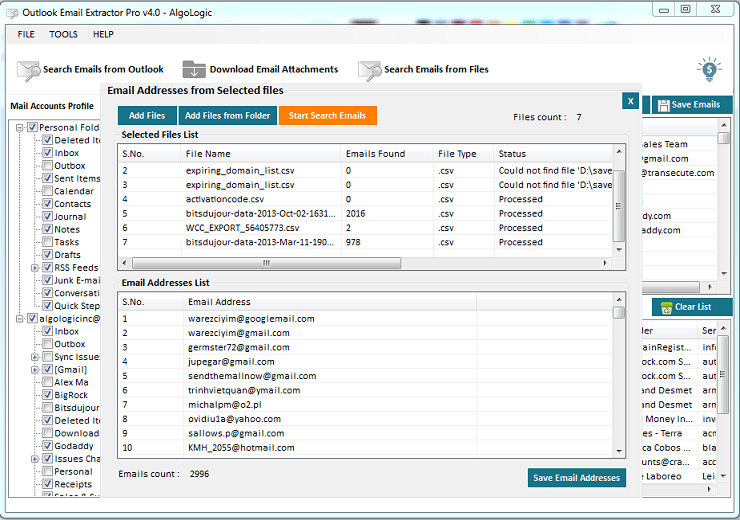 Apply Filter on Extracted Email Addresses list. 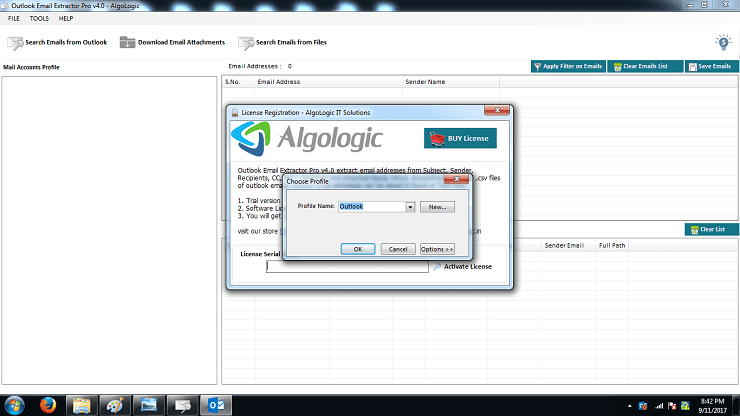 With the help of filters, you can display or remove email addresses having keywords in email addresses (Image-13). Software License Registration. After payment done, you would receive a license serial code that can be entered into registration window => click on "Activate License" button. 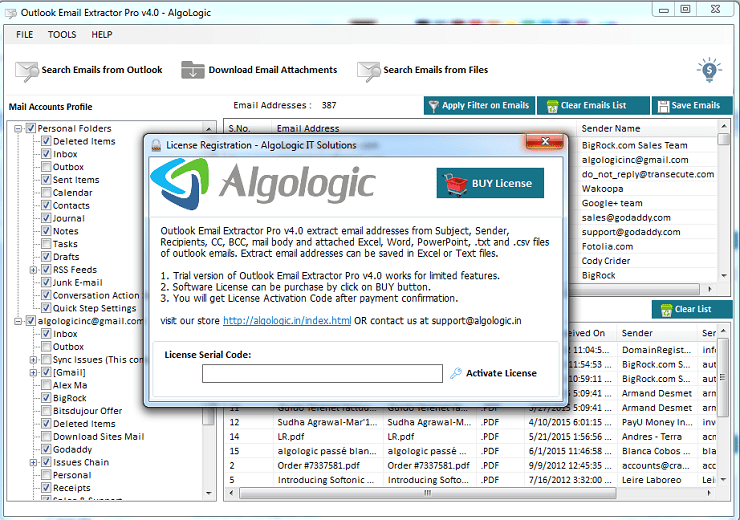 On successful license registration you would be able to use full featured software (Image-14). 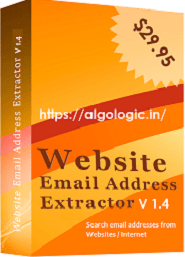 Web Email Addresses Extractor to extract email addresses from websites from the given list of websites and internal links found recursively upto defined level. It is best email marketing software to grab valid email addresses.